I decided to insert a “break wine” in between this one and the sylvaner, because I wanted to drink a red. Unfortunately, it was a bit of a disappointment (perhaps I’ll post about that another time), so we were anxious to get back to Alsatian whites. After a hack job of opening the bottle (I had to fish cork out of both our glasses-- oops! ), I poured us each a glass. The wine had the color of bright yellow gold. I’ve only ever had Pinot Grigio, of the Italian persuasion, but having done my homework, I was expecting something heavier in this Pinot Gris. I’ve seen Italian-style PG described as “crisp” and Alsatian as “luscious”. It was hardly enough of a warning! The wine’s nose was almost overwhelming. It represented nearly all the tropical fruits and in a heavy way. Like a big bowl of tropical fruit salad. I could tell it was both richer and spicier than either of the other Alsatian whites we’d tried thus far. It actually smelled thick and sweet, a little reminiscent of butterscotch! One sip, and I said “hmmm”... it was absolutely full-bodied in a way unlike any other white wine I’d had before. (Meaning I didn’t hate it, over-oaked chardonnay being my only other full-bodied white wine experience- blech!) I tasted a light caramel flavor mixed with super concentrated stone fruit, like apricots and peaches. And in fact, the wine does have some residual sugar, 14 grams per litre, making it more medium-dry than dry (not sure if I like that as much...). I thought the finish tasted more like almonds, but Myles said it reminded him of sacramental wine and thus he didn’t like the finish. “Cheap” was how he described it. I’ve never had the pleasure of tasting sacramental wine so I didn’t think cheap was accurate, but it certainly was dense! K&L’s notes come from reviews in Wine & Spirits and Wine Spectator (which scored this wine 92 points and 90 points respectively). My tasting notes seem completely off base compared to theirs. W&S describes it as clean and fresh, tasting of pear, kiwi and citrus (huh?!). While WS does mention peaches and spice (yay! ), they also mention acidity, which I didn’t pick up on. I recognized the acidity of the Alsatian riesling right away, and found it thirst-quenching. This wine seemed to coat my mouth with its thickness and subtle sweetness. The notes on Schlumberger’s website seem a bit more in line with my experience. Don’t get me wrong though- I liked the wine. It was just so unusual! I’d love to taste it next to one of those crisp Italian pinot grigios sometime, just to see. I do think it probably would have been better with food, unfortunately as a nursing mother I’m finding my windows of wine-drinking opportunity seem to be falling before and after dinner, not during. Anxious to get these curiously tall bottles out of our refrigerator, we dove into the second wine, the sylvaner. 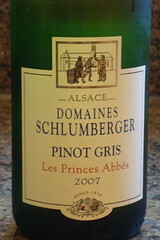 While a fairly common grape grown in Alsace, its not considered a “noble” grape and thus, according to the notes on K&L’s website, the wines cannot be designated “Grand Cru”. They say that’s too bad, because this wine, from Boeckel, is made from grapes gown in the pre-eminent sylvaner vineyard in Alsace- Zotzenberg. I’m quite confused, however, because according to wikipedia that all changed in 2006 when sylvaner from Zotzenberg, and that vineyard only, was granted the right to make Grand Cru wines. I’m unclear on what all that means- if I’m understanding wikipedia, it might be because it's pure sylvaner and not a blend. But, the label doesn’t say Zotzenberg either. Or maybe not enough of the grapes are from Zotzenberg for it to qualify. Regardless of what’s going on, I purchased it for $15.99 and we drank the whole bottle. Until my recent wine reading marathon, I’d never heard of the grape sylvaner, let alone tried it, so I wasn’t sure what to expect. After the riesling we were pretty excited about Alsace wines. In the glass it had more color than the riesling, more of a straw yellow. The nose was pretty one-dimensional to me: tropical fruit, mostly melon. Not that that’s a bad thing, but I spent a good long while staring at my aroma wheel and sniffing this wine and couldn’t get more than melon out of it. It tasted of tropical fruit too, which I wasn’t expecting. I was expecting a lot of the acidity, and thus citrus fruits, that I found in the riesling. Specifically, I thought it tasted like bananas, though the wine wasn’t actually sweet tasting. I actually thought it wasn’t very acidic at all, and it had a general woodiness to it, though not as if it had been aged in oak. It reminded me vaguely of a wine Myles drank while I was pregnant (and thus I only got to smell and spit), the 2008 Merryvale Sauvignon Blanc, which I thought both smelled of and tasted like bananas. (Which was also a bit odd for a sauvignon blanc, because I’m much more used to the acidic, citrus style of Marlborough). The other thing I noted for the sylvaner was the long finish. K&L had far fewer things to say about how this wine actually tasted. Deep and spicy was their description. I can concede to the deep part, but I didn’t get the spicy at all. This either means I’m lousy at wine tasting or we just had a different take. The Boeckel website wasn’t much help either- all en français. All in all it was good, though not great. 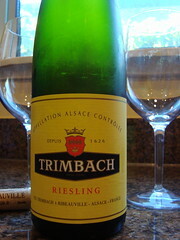 Somewhere amidst the fog of sleep deprivation, we managed to open our first Alsatian wine, the riesling, from Trimbach. Pretty amazing that they’ve been making wine since 1626! It was exactly what I had hoped it to be- delicious! I poured myself a glass of the wine first. It was super pale yellow, very little color at all. I took my first sniff of the wine and said “It smells like riesling”. Genius, I know. But it smelled exactly as I remembered riesling to smell, despite not having had any from anywhere in a good long while. So then I got out my aroma wheel in order to be more specific. It was fresh and fruity, like peaches and a little pineapple. Later, as it warmed up I thought I sensed a bit of honey too. Finally, I took a sip. Yum! The first thing that struck me was the acidity, not overly so, but very crisp. I thought it tasted like lemons and as the wine warmed up, changed to more of a grapefruit flavor. It also had a nice minerality to it, and was even a tad floral. I found myself drinking the wine rather quickly, partly because it was just so darn refreshing, and also because I was tasting, scribbling notes on a little piece of paper and cooking dinner all at once during the brief interlude I had from baby-duty. I started with this wine because not only do I have a soft spot for riesling (after all those years of drinking Chateau St. Michelle- I should try theirs again...), but this was a wine that was specifically recommended (down to the vintage) as the one to try as a representation of Alsatian wines by Kevin Zraly in his book. That’s a lot of pressure for one little wine, but it did not disappoint. We’re wishing that we had room in one of our wine fridges to stock up on this wine- especially at only $16.99 per bottle. K&L has a lot of notes on this wine, and I wasn’t terribly off base with my assessment. The peaches and the mineral note, especially on the finish are mentioned, as is the citrus, and specifically the lemon taste. It does have an elevated level of acidity, 7.9%. I was also glad to see that pineapple was mentioned in the notes, because that’s not something I had expected to smell for some reason. There's also the possibility for zero stars too, which would mean we poured it down the drain. Undrinkable. I thought it was appropriate to begin my worldwide wine tasting tour in the Old World wine powerhouse of France. Since the last several weeks of my pregnancy coincided with when summer FINALLY decided to show up in Northern California this year, I was craving white wine. 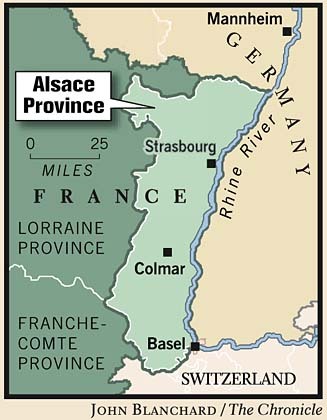 Alsace (acceptable pronunciations seem to be Ell-sass or Al-zas) is a northern wine region (average July temperature of 66 degrees), with very low rainfall, though it is sun drenched. Ninety percent of the wine they produce is white. There’s hardly anything more refreshing at the end of a hot day (in a house without A/C!) than a cold glass of crisp, mineral-tinged, acidic wine. This happens to be the specialty of Alsace. The major grapes grown here are riesling, gerwürztraminer, pinot gris, muscat, sylvaner and pinot blanc, and the wines are dry in style. Unlike some German and US wines made from these grapes, they have little or no residual sugar and thus aren’t sweet (i.e. off-dry), nor is new oak typically used. This preserves the acidity of the grapes- just the way I like it! 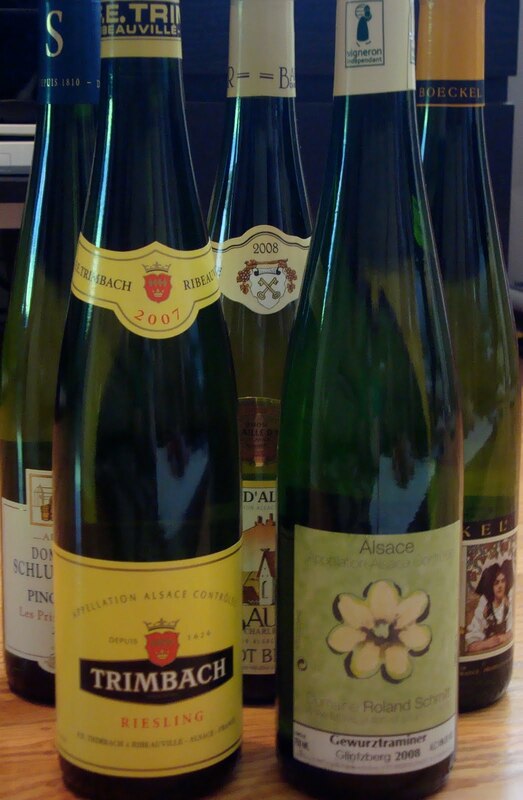 Another fun part of these wines is that they are bottled in the distinctive tall, narrow bottles traditional to the region- typically green glass- called flûtes d’Alsace. And, unlike any other region in France, they put the grape varietal on the label! Yay! At different points in the past this region has belonged to both France and Germany, and the influence of the German culture and language is especially evident in the names of the wines, villages and vineyards. Nestled in between the Vosges Mountains and the river Ill, along the border with Germany, Alsace is really just a thin strip of land. I’m particularly excited about this region (and getting started! ), because crisp, acidic, no-oak white wines tend to be my favorites. I’ve often turned to Marlborough in New Zealand to satisfy these cravings, and find things every now and then from CA that fit the bill, but I think I’m about to discover an additional source. As far as I can recall I’ve never before tasted an Alsatian wine. So one thing that had to happen in order for me to truly begin my education (read: drink the wine), was to no longer be pregnant. I’m happy to report that mission has been accomplished. 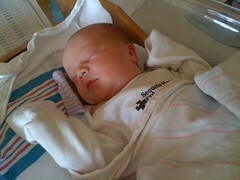 Evan Michael was born on Monday, July 5th at 9:59am weighing in at a whopping 9 lbs! Giving birth is certainly a reason to celebrate, and it seems that much to the consternation of the French, we Americans turn to Champagne only on such occasions. Myles and I opted not to order the “champagne” on the Birthday Dinner menu we were offered the night before leaving the hospital (after being served margarine, packets of creamy Italian dressing and “breakfast syrup” for my pancakes with my hospital meals, we didn’t trust their taste). Instead we waited until Thursday to open the bottle of Champagne I had picked up in late June in anticipation of this exact occasion. It was quite good! Light, acidic and a little yeasty. Made from 60% pinot noir, 30% chardonnay and 10% meunier, it was the typical light gold color with teeny little bubbles. The perfect little glass of bubbly to celebrate to arrival of my new little boy. Cheers!